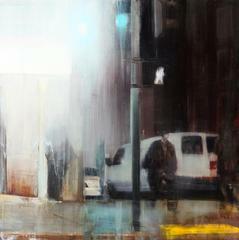 Thinkspace is pleased to present Dirty Laundry, an exhibition of new work by painters Brett Amory and Adam Caldwell. Amory and Caldwell each mobilize their unique representational strategies to invoke the modern day disconnect between time and space, self and other, and present and past. Amory's atmospheric preoccupation with memory, the moment, and nostalgia, is dynamically in contrast to Caldwell's abrupt composites and recombinations of imagery, from sources spanning mass media to antiquity. Both artists approach their medium as a means of problematizing temporal identity, and the social experience, by exposing the nitty gritty polarities and paradigm shifts of an increasingly fractured reality of the self. Brett Amory's new body of work is a continuation of the artist's acclaimed series Waiting, a series in which the artist captured his subjects in varying states of suspension and anticipation: waiting for the completion of an unseen event and caught in the standstill of a moment. Amory's work relies on photographic media as a means of capturing and documenting the every day subject matter with which he is concerned. He translates these photographic observations into paintings which seek to capture the immediacy of the moment. The artist uses photography as the primary point of departure in his process, and uses it as a social tool of observation to capture the world around him. He reduces these images to their most striking and elemental parts compositionally, and attempts to convey the fleeting quality of these moments through a painterly and impressionistic treatment of the photograph. This new body of work, however, conveys a sense of spontaneity and immediacy new to the artist's practice. In Amory's earlier work, the preparatory process was deliberately staged and set in order to conform to the artist's predetermined narrative and aesthetic vision for the painting. Now that the photograph has become an increasingly mobile and socially voyeuristic tool, with new applications such as instagram on the mobile phone, the moment seems less mediated by the staging of process. Amory is free to capture actual moments in the lives of others in passing with this technology, spontaneously, and organically. This technological filter functions as a conduit for the experiences the artist invokes in paint. The end result is a body of imagery that authentically captures the artist's real time observation of his subjects, and their daily experiences and encounters. Brett Amory strives to convey his observation of the world around him through work that invokes its passing and transience. The daily routine of the artist's life, and his observation of the life of others, is central to his process. The work captures a human point of exchange in the creation and inception of the image. Adam Caldwell's background is variegated, a multiplicity clearly evidenced in the artist's work. 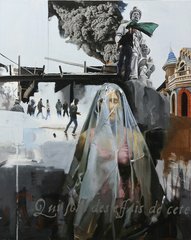 The artist's interest in comics, and ultimately narrative based graphic media, coupled by a highly developed technical acuity for figuration and spatial construction, results in a distinctly unique and recognizable style of painting: a style that is deeply imbricated in, but ultimately subversive of, the communicative shorthands of a variety of visual media. The artist is deftly able to invoke not only the formal properties of those languages, but the affective tone and mood of them as well. Caldwell's work is informed by an observation and collusive synthesis of these visual media and their corresponding affects. The work presents a patchwork of visual multiplicities and polarized sensibilities. The surfaces are fraught, and frenetic, recombinations of the contemporary experience as observed by Caldwell: an experience in which the self is split and colonized by a competing network of forces. Formally the work speaks to this freneticism and fracture, combining a collage of styles and influences spanning everything from illustration, photorealism, and classical figuration, to the bombast of advertising and consumer culture media. The artist combines pop cultural imagery with post-apocalyptic images of destruction, and suggestions of advertising with images of warfare. Distinctly dystopian, the self is untenably situated in the midst of these rupturing forces as a complex and fractured entity. The "self" in Adam Caldwell's work is subject to the ravages of an age where pop culture and mass destruction seem oddly at home together in the same image. Caldwell conveys the paradoxical nature of the contemporary psyche: a terrain of unreconciled impulses, libidinal urges, and conflicting imaginaries. Caldwell's imagery is complex - a sort of social architectonics. Meaning becomes a process, self- consciously crafted by the associative juxtapositions laid out for us by the artist. A common thread in this work is its intentional ambivalence and recombination, the viewer is left feeling the pull of unreconciled subjects and themes, and is unable to reductively ascribe a singular meaning to them. Aesthetically seductive and visceral, and consummately executed, the paintings are captivating and unrelenting. We are caught in their grasps and actively participate in their meaning.